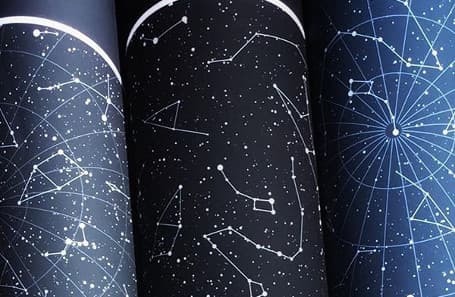 Create your unique star map that depicts the exact constellations and stars visible on your chosen date from your chosen location. 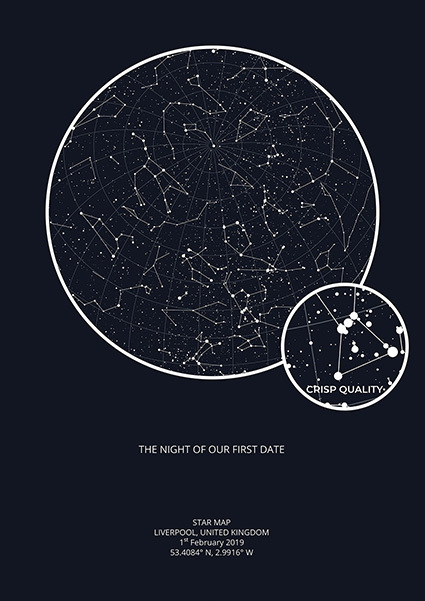 Use our Star Map Builder to personalise your star chart and to choose a framing option. Accuracy guaranteed! Our algorithms use over 2 mil. stars to generate your star chart. Make your own map! Choose any location: your hometown, the place you got married or your favorite city: i.e. London, New York! Choose between framed map print, print with poster hanger or only the print itself. Personalise it! 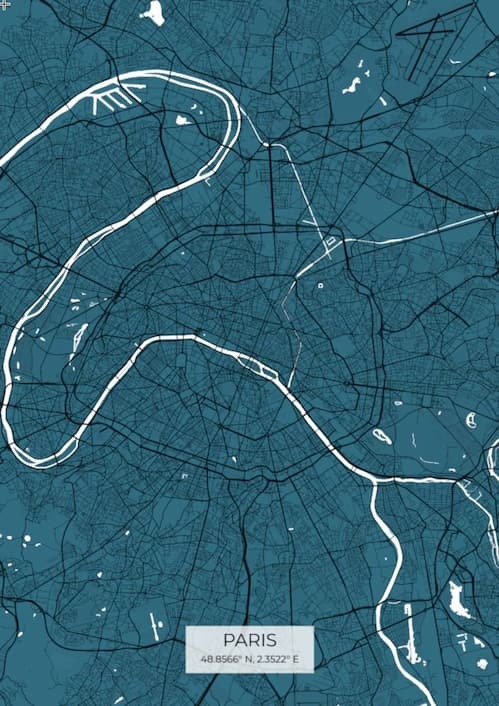 Our City Map Maker allows you to add a personalised message to your map! Write a personalised message to celebrate your special night! 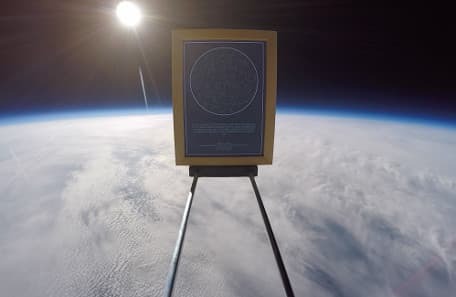 Inspire your loved ones to reach for the stars with an amazing gift that will last a lifetime! Each map is carefully checked twice before the final stage where it passes through quality control and is then packed into a protective poster tube and sent straight to your door. All of the data used has been tried and tested for many years by astronomers all over the world. We only use the best printers in the industry together with museum quality paper and specific inks to ensure the poster quality is second to none. In the very unlikely case you’re not happy with the print then we have you covered with a 28 day full money back guarantee. 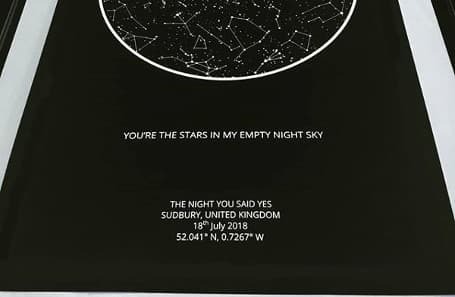 From the background colour to the personal message, you can be sure of that “wow” factor when the recipient opens this magical gift and sees how you have tailored their very own night sky. All you need is a special date, location and some meaningful words. Place your order before 4PM and we will ship your map the very same day. Delivery is via Royal mail 1st class and takes 1-3 days. Shipping is FREE in the UK unless you want our next day delivery service for a fee of £6.99. We also offer International shipping all over the world for £7.99. We are open Monday to Friday from 9am - 7pm and 9am - 5pm during weekends. All orders will be dispatched within 12 working hours and sent free via Royal Mail 1st class delivery (1-3 working days). Orders outside of the UK are sent via Royal Mail Air Mail (1-7 Work days). Full Money Back Guaranteed within 28 Days if you or the recipient of the gift is unhappy with the print quality.